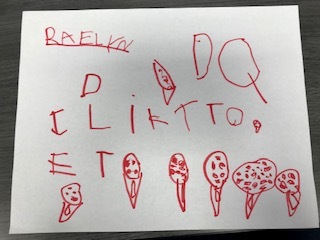 Raelyn K., Kaleo P., Olivia P. and Anna L. all drew pictures of the food places that they like to go to in town. 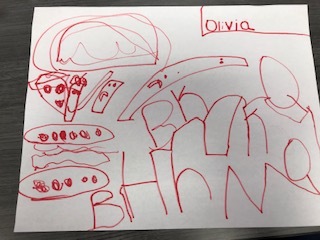 The students have been in centers that are based on real life situations, and this is called the “Tools of The Mind.” The students from Mrs. Slezewski class are doing restaurants in Shawano. 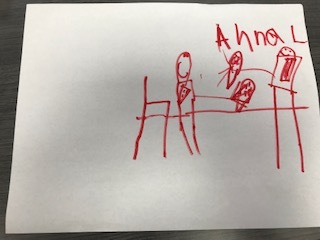 Briar, who is in Kindergarten, drew a story of a caterpillar that was turning into a unicorn. 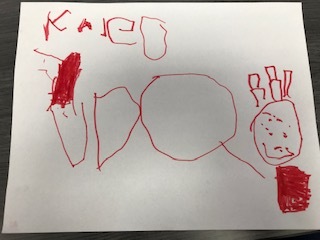 The reason she drew this was because she thought a lot of people would like it, and she loves the rainbows in it. 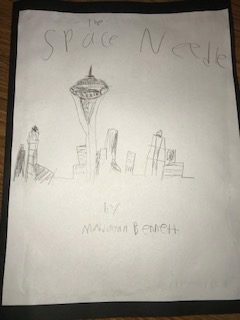 Maddalynn, who is in second grade, researched and drew the Space Needle. The reason why she chose the Space Needle was because the Burj Khalifa and the Eiffel Tower were taken already from other classmates in her class.